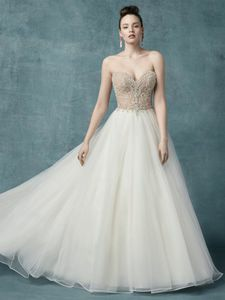 Description: Exquisitely beaded lace motifs and Swarovski crystals adorn the bodice of this princess wedding dress, completing the sweetheart neckline. Voluminous ballgown skirt comprised of tulle, trimmed in narrow horsehair. Finished with crystal buttons and zipper closure.